This Week’s Outlook Features Wind and Possible Snow! 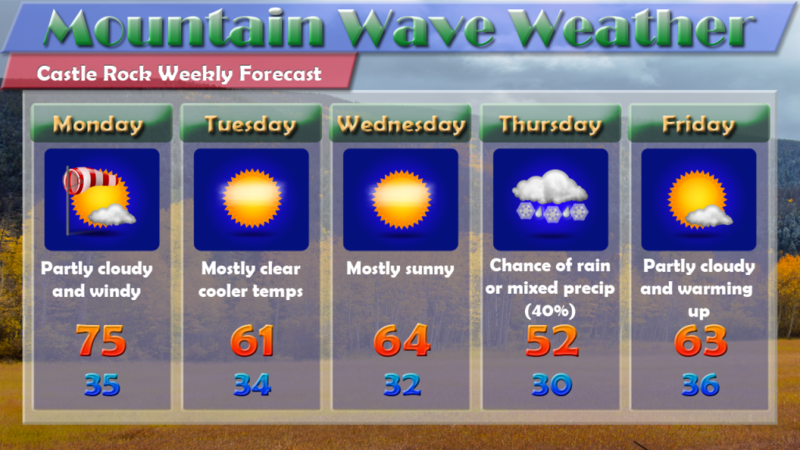 We will see a bit of everything with the weather this week in Colorado. Many areas along the Palmer Divide region will start off relatively warm on Monday but very windy as a cold front moves through into the afternoon hours. Expect temperatures to generally reach the low to mid 70’s with strong winds. 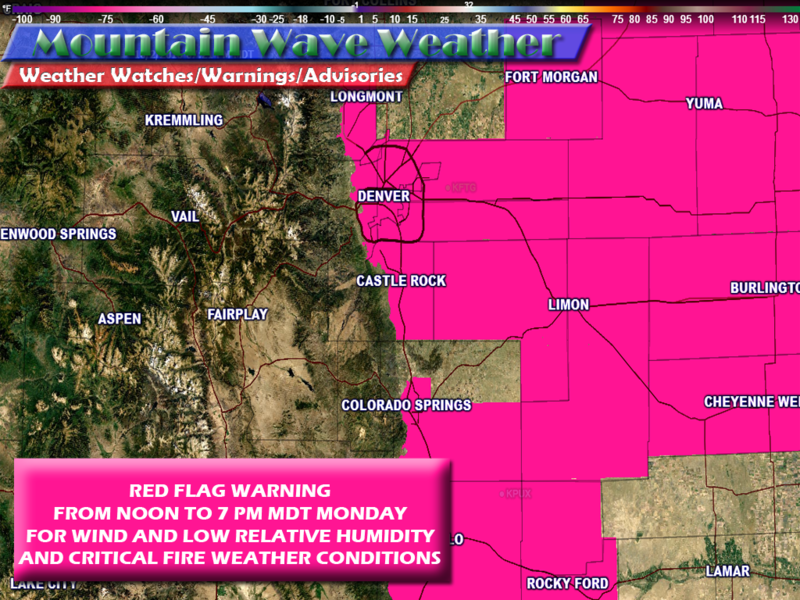 High fire danger will be a concern due to the strong winds and low humidity. 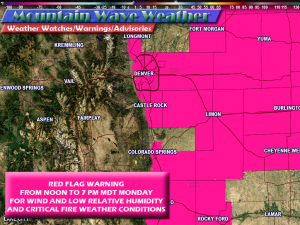 Red Flag Warning will be in effect from Noon to 7PM today and includes the Castle Rock area and points to the East. Tuesday and Wednesday will be a bit calmer but noticeably cooler for daytime high temperatures than what we’ve seen over the past few weeks. There is a very small chance for precipitation for some areas on Tuesday but the chances look very slight. I wouldn’t expect much if any precipitation to fall on either Tuesday or Wednesday. Thursday another strong front moves through, there is still some uncertainty about the exact track and strength of this storm system, but it’s ultimate location will make a huge difference in what we see Thursday morning. We will highlight snowfall chances/accumulation amounts and details below. Friday looks to start a clearing and warming trend as we see temperatures back up into the 60’s with clearing skies. Thursday is the day that has most interest in the meteorological community. Depending on how the storm system ultimately sets up, we could see flakes flying early Thursday morning with the passage of a strong front and associated storm system. For now, let’s actually talk about the possibility of snow… if we get any and how much we might expect. As is often the case, we have a bit of disagreement among models, some showing colder temperatures and more snow accumulation than others. Some models show snow falling but none accumulating. I’ve posted 2 looks at popular models below, the NAM and the GFS. Keep in mind, these are only one model run so neither can be viewed as the end all be all for this week. 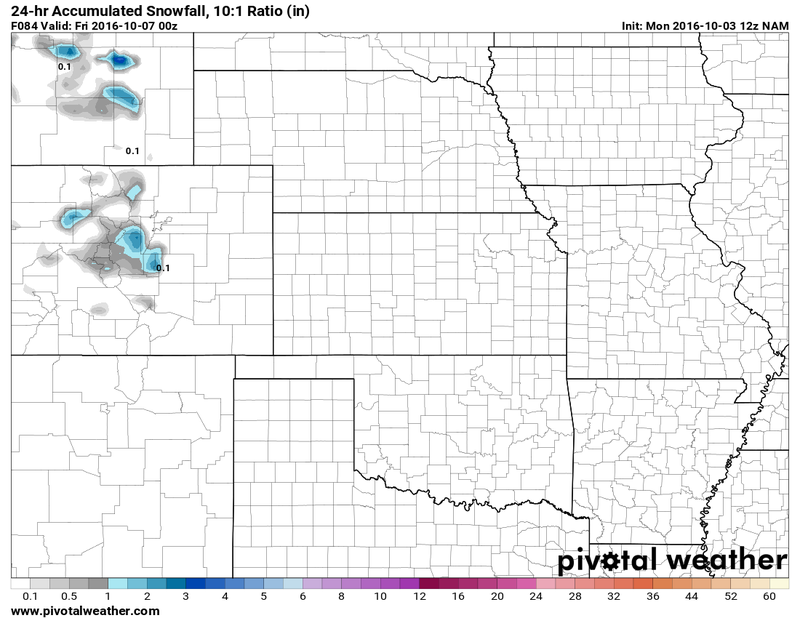 Notice the GFS shows markedly more snowfall along areas in and around the Palmer Divide. If this were to verify, we could see up to 2-3 inches of snowfall accumulation. 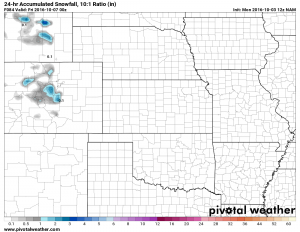 The NAM however, shows a very sharp cut off line for snowfall accumulation. The NAM does predict warmer temperatures overall during this period so while snow may still fall, it may not accumulate to as much as the GFS expects. One other product I like to keep an eye on for clarity in these situations is the NCEP SREF Plume which is a bunch of models run together and averaged out. Not as pretty as the graphical ones I’ve posted above but still useful. The tricky part is that there is no run for the Castle Rock area specifically, but I take an average of the one at Centennial Airport and Monument Hill as our elevation sits roughly in between theirs. If you take the mean projected snowfall between the two you get a number of 0.21 inches of accumulation. This number will no doubt shift upwards or downwards over the next couple of days based on more data coming from more models. We know that cold air will definitely be sliding in with the storm system on Wednesday night into Thursday. Temperatures will be cold enough at the very least for a rain/snow mix and if temperatures trend lower snow will be possible. With the varied terrain in and around Castle Rock, I would not be surprised to see some areas with overnight low temperatures in the upper 20’s. Temperatures? Not a ton of model agreement on this yet and the number will be important. A degree or two warmer and we get rain or a mix, a degree or two colder and we could see snow with possible accumulation. At this time I’d go with cold temperatures and a rain/snow mix, possibly all snow in higher elevations along the Palmer Divide. I’d expect total accumulation to be between 0 and 0.5 inches, but I am leaning heavily towards that 0 number with the latest data. I’ll have more posts up through the next few days as new data comes in and the forecast changes. Stay tuned!